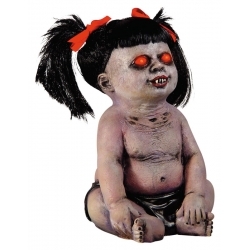 Creepy Dolls are always popular at Halloween and our Demonic Doll is a little unsettling to say the least! Measuring 46cms. in height this creepy halloween prop has a built in sound sensor and when activated the eyes light up and the head turns. With grey musty hair, posable arms and the added feature of sound, this Sitting Doll is a great addition to the halloween props and decorations.